Note: Mobile users might have to select the “view desktop” option on your phone to see the tab. Click here to visit the Green & Black facebook and like them. 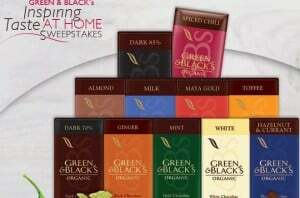 Then one the “Inspiring Taste” tab, fill out the form to enter their sweepstakes. There will be a total of 900 winners (100 per month) that will score 2 free 3.5 oz. bars of Green and Black’s (mixed variety). This sweepstakes is running throughout the year and you can enter daily if you’d like. Good luck!